Lightweight and easy to assemble and use. When you need extra storage but not extra furniture. Great for laundry/clothes, toys, hats and mittens, diapers, etc. Espresso finish on the wood. Ecru canvas drawers. Easy pull out drawers are a breeze to load and unload. Stoppers on the drawer tracks prevent the drawers from being pushed out the back of the unit. Drawer bottoms have supportive hard panels so contents won't cause the drawers to sag. Canvas drawers are removable from the drawer frames and can be spot cleaned as needed. 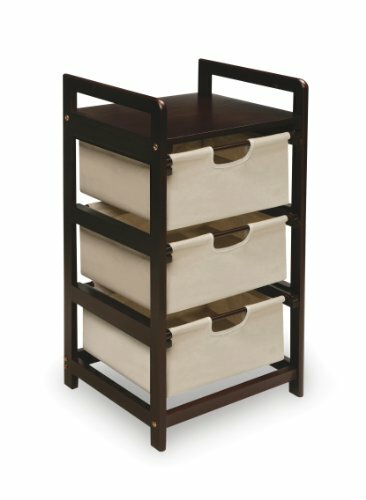 Canvas drawers are 80% cotton and 20% polyester. Overall unit measures 15" W x 14-1/8" D x 29. 5" H. Drawers each measure 12" W x 11. 5" D x 6. 5" H. Some easy assembly required with a screwdriver. Illustrated instructions included. Product may vary slightly from shown. This item ships in its original carton which may include a photo of the product. All measurements approximate.